In a medium bowl, combine tomatoes, vinegar, paprika, garlic powder and oregano. Place a thin layer on bottom of slow cooker. In a medium bowl, combine turkey, onion, quinoa, salt, pepper and egg. Pat cabbage leaves dry and place rib side down. Divide mixture evenly between cabbage leaves. Roll each leaf into a cylinder, tucking the sides to create a tight roll. Place in slow cooker and cover with remaining sauce. 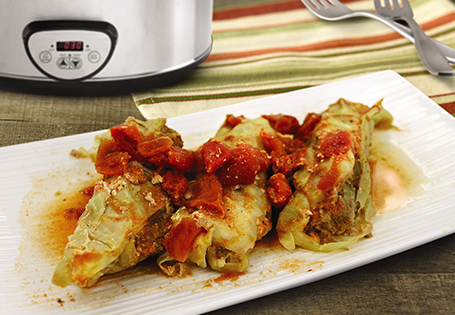 Turn slow cooker on low for 8 hours or high for 4 hours.